Jubilee SG Raphael Tuju beaten up in Nakuru following discrimination claims. - Bana Kenya News, Real African Network Tubanane. Home Unlabelled Jubilee SG Raphael Tuju beaten up in Nakuru following discrimination claims. Jubilee SG Raphael Tuju beaten up in Nakuru following discrimination claims. The Jubilee Boss Raphael Tuju was beaten up today in Nakuru following allegations of supporting certain aspirants. 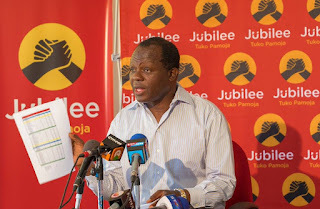 The unknown group fought Jubilee Secretary Raphael Tuju because of encouraging discrimination in the jubilee party even before the party primaries. According to the jubilee officials, it is claimed that the unknown people were funded by a popular aspirant in the area. The Jubilee secretary general went further to attend a meeting in Naivasha. Tuju has been allegedly sponsoring some aspirants in the Jubilee stronghold as the Embu jubilee official pose rigging claims. According to the Embu aspirants, some of the party official allies have already set aside ways of getting the party certificates. In Nakuru, the current governor Kinuthia Mbugua who is an ally to the president Uhuru Kenyatta claimed to set a way of manipulating the nomination polls. The Jubilee secretary general Raphael Tuju is alleged to prepare a way of the Governors to win in the Jubilee nomination process. The Jubilee SG did not get time to explain the allegation but the party is yet to provide an official report on the incidence. The National assembly majority leader Adan Duale has condemned the act and urged people to conduct free, fair and peaceful nominations.